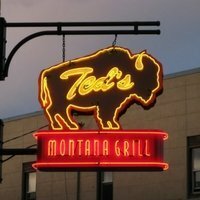 Ted’s Montana Grill consists of a chain of restaurants renowned for its bison dishes and cuisine. As the restaurants have grown, the offerings has become varied and now includes appetizers like onion rings and grilled shrimp as well as soups, salads and classic dishes. Below are the latest Ted’s Montana Grill menu prices. Ted’s Montana Grill prices are somewhat more expensive than the average, with their Bison Pot Roast costing $18.50, the Bison Meatloaf $14.50 and the Cranberry Glazed Roasted Chicken at $15. Their appetizers are cheaper, with the Bison Nachos costing $8 and the grilled shrimp $10, while their mini cheeseburgers cost $8 to $10. While Ted’s Montana Grill prices are higher than others, it has maintained its popularity with many customers. The restaurant was established in 2002 by Ted Turner with the first one opening in January 2002 in Columbus, Ohio. Turner and his associates decided to get in the business in an effort to keep the bison from becoming extinct. Ted’s Montana Grill now has 44 locations in 16 states though its headquarters is still in Atlanta. Aside from serving National Bison Association certified bison, other vegetables and meats are available on the menu. In addition, the restaurant is known for being environmentally conscious. For more information about Ted’s Montana Grill, visit their official website.